This French onion soup recipe is such a French classic – it's hard to believe it's such an easy soup to make. It's very economical and provides lots of nourishment for your family especially on a cold winters day. I well remember the onion Johnnies coming around our village when I was young, selling their lovely onions on long ropes. We often had a big pan of onion soup made from these after their visit. If you wonder what were the onion Johnnies, take a look ﻿here﻿! 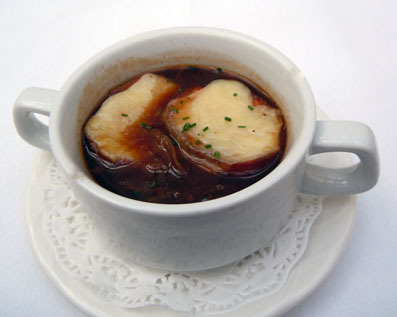 There are some very quick recipes for onion soup but they don't do it justice. With this recipe you will have a delicious mouth-watering golden soup to be proud of and they will definitely come back for more! You will love it! It helps get rid of a nasty cold too – just add more garlic, it works every time for me. 2 tbsp brandy (optional), but oh so good, especially for a cold day! • Heat oil and butter over medium heat. • Add chopped onions and cook slowly in covered saucepan for 15 minutes. • Remove lid and stir in the garlic, thyme salt and sugar. • Cook for about 40 minutes, stirring frequently until the onions have turned a lovely golden brown colour. • Remove from heat whilst you stir in the flour until it is well blended. • Return to the heat and gradually stir in the boiling stock and the white wine. • Simmer the soup, partially covered, for about another 40 minutes. • Taste again and season if needed. Prepare the hard toast by rubbing each piece with the garlic clove. When ready to serve, pour into a soup tureen or soup cups, over the rounds of bread. Pass the cheese round separately so each person can take what they want to sprinkle over the toast. Now you will know just how good this French onion soup recipe really is, and want to make it whenever the fancy takes you.